Did your March come in like a lion or a lamb? Our March arrived promptly on the 1st like a beautiful snowy lion, shaking off its mane and raining down enormous snowflakes the size of dimes and quarters, which fell straight down out of the sky, blanketing the ground for a few hours. The contrast of white with the evergreens and rhododendrons combined with the dark stillness of our little mountain lake was absolutely spectacular, but unfortunately, was too difficult to capture before the snow had mostly melted away. 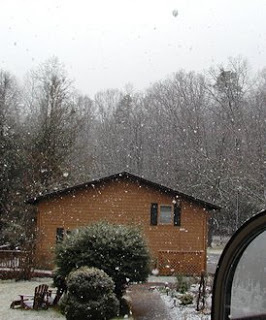 We did get some of the huge snowflakes on film, as you can see above. Now that we’re heading back to sunny, Spring-like days this week, we’re finishing up our solarium project. It’s coming together quite nicely! We can’t wait to share photos with you later this week, when we’ll be reporting on the entire project.